Last year, the Economist had pointed out in their daily chart that 16 in 1,000 Koreans had done some sort of plastic surgery procedure – this number does not take into account the tourists who come into South Korea for procedures. 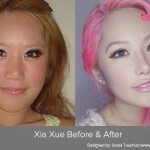 It is a little known fact that since the early 2000’s, the popularity of the Korean Wave had soared where many from other Asian countries are very much influenced by the Korean culture and media; people from Taiwan, China, Singapore and Malaysia, to name a few, have chosen to revamp their appearance over at South Korea. As you may know, the beauty standard in Korea as well as in Asia is one of a youthful appearance; procedures such as Korean anti-aging procedures and double eyelid surgery are commonly done. This isn’t surprising, as the beauty norm is that of fair skin, a nose with a high bridge, big, double-lidded eyes and a V-shaped jawline. In a sense, the youth are getting surgery in Korea to have a “Warren Buffett” nose. His nose has a very high bridge, and has a lot of fat around it. Whatever does that mean? You may be thinking, "Warren Buffett? Isn’t he an old, balding grey-haired businessman?" What in the world am I getting at? Well, that’s exactly it! There is this prevailing belief in Korean culture, and perhaps other Asian countries that by changing one’s appearance, you are also changing one’s fortune. Can you blame them? Most job and school applications in Korea require a photograph, so we can assume that to succeed in their society, looks do matter. What is concerning , however, Is that instead of going under the knife, Korean teens resort to DIY V-line face enhancements as well as other “Do-it-yourself” facial enhancements. Though no official statistics for how many are hurting themselves from these unwise alternatives have been found, it is still a worrisome issue as children as young as elementary-aged are tinkering around with these dubious devices. Do you live in Korea, or other parts of Asia? How about the rest of the world? How far would you go, to change your looks, to change your life (if you believe in that sort of thing, or at least your culture does)?